A number of years ago, I was introduced to the game “Close Action,” which is a board game about naval combat in the “Age of Fighting Sail,” circa the year 1800. 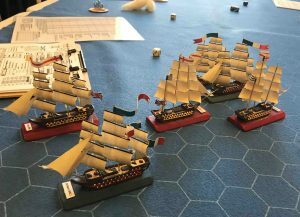 It is basically an improvement of the old Avalon Hill game of “Wooden Ships & Iron Men.” Close Action was designed by Mark Campbell, although he has had a lot of folks play various scenarios and offer suggestions for improvements along the way. The game was published by Clash of Arms games in 1997. But then I didn’t get to play the game for more than a decade (probably closer to two decades). 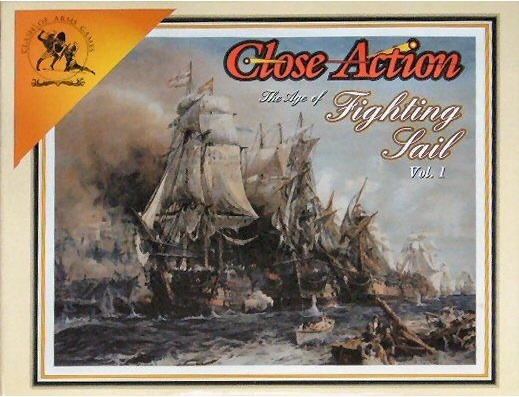 Close Action box cover, from Clash of Arms games. So, probably around the middle of 2017, I was checking out the latest sales flyer from Noble Knight Games, and I saw they had a brand new copy of Close Action for sale. I immediately bought the game, because Close Action has been out of print. Noble Knight also had the two add-on scenario packs of Rebel Seas and Monsoon Seas for sale, so I bought those, too. (Rebel Seas is the only product from the Close Action series available for sale at the Clash of Arms web site, as of February 2019.) So now I owned the basic components of Close Action, but didn’t have any miniature ships to play the game with. Although CA was designed as a board game, it does seem more fun to play when using miniature ships. I was still in contact with Jim Robinson, as he races in our CFR-Detroit racing games. He’s the guy that introduced me to Close Action in the early 1990s. We were playing then with “pre-publication” rules for the game (version 4.30). Dennis Daughetee was another player, and between Dennis and Jim we had a good sized fleet of miniature ships to use. 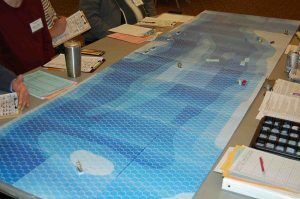 Anyway, in March 2018, we got several folks together to play a scenario of Close Action at the Canton (Michigan) public library during the first Saturday meetup boardgame day. We used (I believe) 1:900 scale ships on Jim’s large hex mat (with 2-inch hexes). It was pretty cool. Close Action with 1:900 scale ships at the Canton, Michigan, library. Now, the large 1:900 scale ships are really neat, but later, while playing another scenario at Imperium Games, with about a dozen ships on each side, it became apparent that it would be very difficult to get all of the ships on the same playing mat at the same time. This made me want to use smaller scale ships. I began to look into the various ships available. It seems that 1:1200 scale is a very popular scale for naval minis from the Age of Sail, and it seems the two main sources for ships are GHQ’s “Micronauts” and Langton Miniatures. GHQ’s ships are about $17 each, though, and the Langton ships are about the same price, once you buy the hulls and sails. Sort of a steep price if you want to purchase enough ships for a 40-ship battle! So then I discovered the 1:2000 scale ships available from Valiant Enterprises. While Valiant’s ships are not nearly as detailed as the larger 1:1200 scale ships, they are much more affordable, and they are “good enough” for minis gaming. You can buy a 3-pack of 74-gun ships-of-the-line from Valiant for less than $15, or $5 per ship. Now we’re talking affordable! Not to mention that the ships won’t take up as much space, so one can use a smaller hex grid to play on. What made it even better, just about the time I mentioned to some of our Championship Formula Racing group that I was going to start buying the Valiant 1:2000 scale ships, two of the CFR racers, Jim Robinson and Mike St. Peter, gave me a bunch of already built and painted ships! Jim gave me close to 40 ships, mostly 74-gunners but also a few larger and smaller ships. Mike donated around a dozen serviceable ships to me, and some other parts that can be salvaged to repair some other ships. Close Action enlarged maps A & B. 1:2000 scale British 50-gun Adamant and French 64-gun Ardent, mounted on foam-core bases. So, now we’re ready to start playing some semi-regular games of Close Action in the Detroit, Michigan, area!